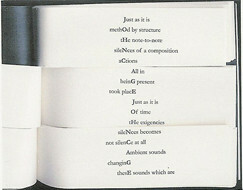 JH: in the poems posted, my methodology emerges through chance operations and formal boundaries. i decided that for this project, titled, the dead love, i would attempt an architecture that fosters new ways of reading material i had been spending a lot of time with. i was trying to undo, demilitarize, deconstruct, re-perform, pre-perform my own reading of material based on ethics. most of the texts i had been reading (and continue to read) have to do with the ethics of philosophy, poetics and psychoanalysis. as i read these texts they seemed to call for their own distribution or dissolution. by chancing through a long series of quotes i had compiled from my readings i went about composing a new path of reading through writing. so more specifically, the content is bound by the texts i have been reading. and because these texts continue to point toward otherness, void, and psychoanalytic formation, the arising of the mesostic form seemed to fit well as one way to let those ideas and formations become. JB: How do you see these poems as social? How are they spatial? JH: i believe that language is inherently social. sociality is the stuff of language. so with that in the forefront of my thinking i like to imagine hospitality: open invitation, threshold, exploration, communion. i don't want to tell someone how to experience the architecture and content of my home. rather, my hope is to provide a container for active dialogue and thinking. in that sense i am also thinking of the authors of the texts which these poems are culled from. i want the authors from which i am culling to be an active part of the dialogue in the same way the print on the wall or the fabric of the couch or the ceramic of a mug might take center stage and speak in a conversation among us. i'd like to provide context for a multiplicity of voice, of interpretation and dialogue at the same time holding the ethic of hospitality paramount in the text. the social space of hospitality is the point from which i hope to begin. these poems are spatial in a few different ways to my thinking. i think of them as engaging a space on the page, a historical space, a contemplative space, a psychoanalytic space, a de-compositional space. these spaces forming and dissipating differently through the poem for each active guest. in the act of creating this writing i have been thinking quite a bit about de-compositional processes in nature, the slowness of attempting to cultivate new and different practices of community. my process has aimed toward taking my own relationships to texts and trying to slowly let them decompose and dissolve within an architecture of hospitality: to become a place for animals to gather. JB: In our commentaries we’re exploring moxie politik—poets taking poetry off the page and intervening in various social spaces. I know you have an interest in poets vaulting into the public sphere. Who is doing this now in ways you find provocative? Who’s got the moxie? JH: chicago poet jennifer karmin has the moxie! jennifer's projects get me all excited about a public poethic. her projects have inspired me to find ways to move outside of the page...or to move the page outside. one project i've found very exciting in it's community engagement is a walking poem jennifer staged in chicago starting at the chicago picasso sculpture. asking poets to send her poems and walking directions, jennifer read a poem out loud then gave a copy of the poem read to a passerby or listener in an envelope that read on the outside, "this is for you." then she continued on with the motion directions given by each poet. these kinds of pedestrian poetic gestures are activist and important to the vitality of our communities. moxie! For an engaging example of inwardly spatial readings of texts, see Davidson’s (2007: 31-32) gloss on Alice Notley’s work as well as Kim Duff’s (2008), consideration of the urban spatiality in the poetry of Louis Cabri and Rodrigo Toscano. Ian Davidson, Ideas of Space in Contemporary Poetry, New York: Palgrave Macmillan, 2007. Kim Duff, “The Spatial Logic of Louis Cabri and Rodrigo Toscano’s Urban Poetics,” XCP: Cross Cultural Poetics 19 (2008): 22-40.